Japanese Traditional Performing Arts Live! A man who had been exiled to Japan, Rōikkan, upon learning that his motherland of Ming had been conquered by a Mongolian tribe called the Tartary, crossed back over with his second wife and son to the continental region of China. 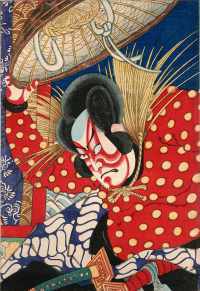 He sought help from the husband (named Kanki) of his daughter by a previous marriage (named Kinshōjo) but Kanki would not agree to help. Kinshōjo’s death having severed his relationship with her, Kanki consented to become an ally. Rōikkan’s child, Watōnai, had his name changed to Kokusenya, and his mother committed suicide, thus carrying out her duty as a Japanese woman. So began the battle for the restoration of the Ming country.